Successfully Added Stunt RC Car - Monster Edition with LED Lights (220V) to your Shopping Cart. The new Monster Edition Stunt RC Car is great fun for both adults and children alike. With a unique see-thru wheel design and fun LED lights, this RC unit makes your radio controlled car stunts fun and exciting both day and night. This RC Car comes with a cool hand held RC remote controller that has two individual back wheel throttle drive, plus a top button for back wheel drive mode. 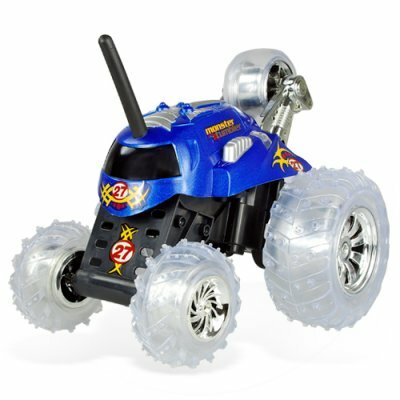 The RC monster car edition is made with high quality molded plastic to absorb pressure quickly when knocked about and keeps on going and going. The base is designed to simulate the monster truck rally experience, and the wheels come in shinny gloss alloy. Children nowadays love these RC toys, and why shouldn't they! Just imaging if we had such cool toys when we were kids? This definitely makes a great present for yourself as well as for your children. This RC unit is in stock now and available for single piece or stock orders. From the leader in direct from China wholesale electronics, Chinavasion. Performing amazing wheel stunts both day and night. Be sure to check out the other great RC toys for sale in this category - direct from Chinavasion!